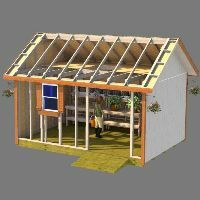 Your shed roof framing is not as complicated as you might think. 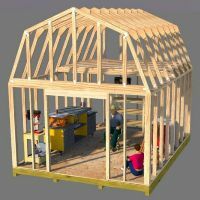 If you are like most people who attempt to build a shed, you probably have a good idea of how to do everything construction wise. Except of course the roof. Floor framing, wall framing, and building your door are not so difficult. But what about building the shed roof? How in the world will you figure out the truss or rafter angles for a gambrel style? Or a gable or even a saltbox style? Should you 'stick frame', or build 'trusses'? Which is easier, and which will be the sturdiest? 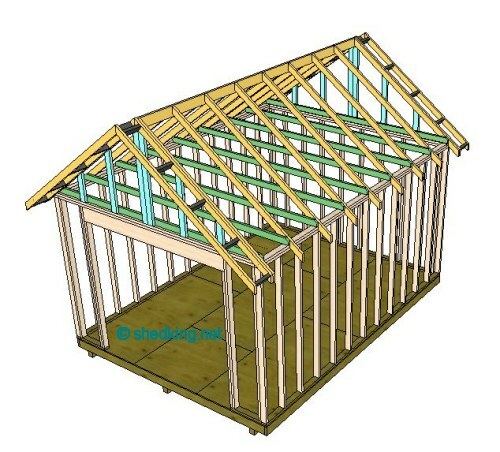 What is a stick framed roof and how does it differ from a roof built with trusses? 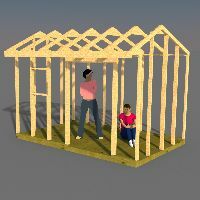 A stick framed roof uses 2x4's or 2x6's or whatever you are framing with, but has a ridge board running down the middle ridge line. You then have rafters running down from this ridge board and resting on the top wall plates. Sometimes the rafter will have a 'tail' and extend out past the wall so that you have a soffit, or overhang. 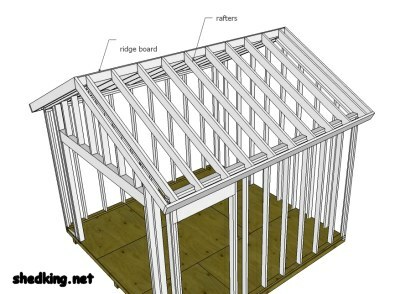 A shed roof that is not stick framed will be built with trusses. 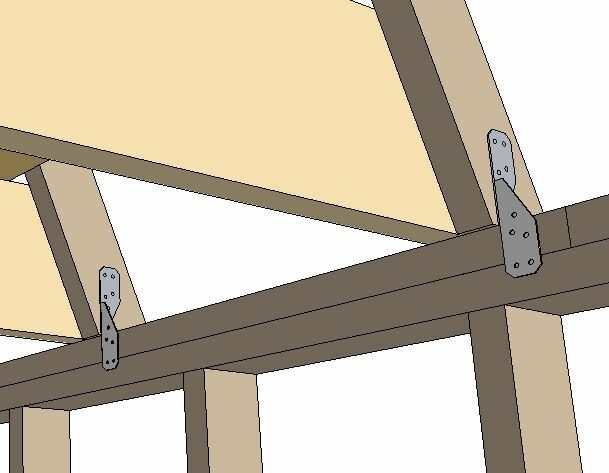 I have found in all my years of building sheds that using pre-built trusses is so much easier and simpler then building a shed roof with a ridge board, especially if you are building your outdoor shed yourself. Most of the assembly work can be done down on the ground! You can actually build a jig on your shed floor or any open flat floor that has enough room. Build one truss, check to see that it fits, and if it does, you are good to go with the rest of the trusses. You can build them all just as you did the first one, and they will all be identical. A gable style is the easiest to build, but offers very little storage in the attic. Unless of course you have a very steep pitch on your trusses or rafters. Then you will have more storage. The steeper the pitch though, the harder it is to put shingles on. 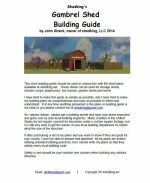 Detailed guide to building a gable roof for your shed. as opposed to the gable or saltbox designs. 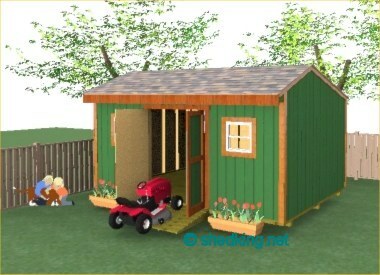 This design offers the most storage space for a storage shed provided the side walls are 6 foot or more. 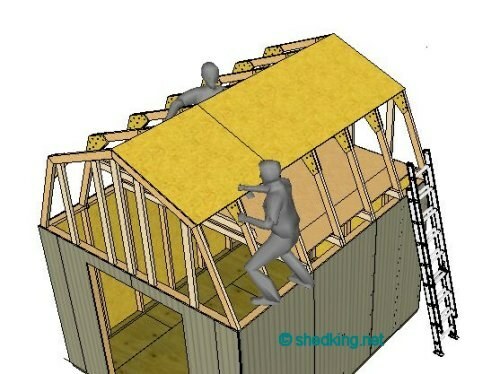 Building a loft in the roof cavity is easy and provides much more storage space than either the gable or saltbox sheds. Do you want to build a shed that makes a perfect garden shed? The saltbox roof design offer lots of character and charm to the backyard. So much so that it is my very favorite style shed for a garden shed. Add bright colors for painting the exterior walls, and flower boxes under the windows and you have just a really neat garden shed that you can build in your wifes garden. It offers so much style and comfort to the garden that you can design the interior to be a sitting area just to relax in and enjoy the scenery of your beautiful garden or warm summer nights gazing up at the night sky. Guide to Building and framing a saltbox style roof. 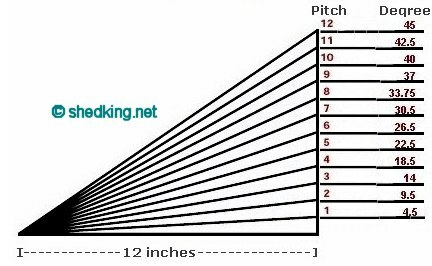 One thing you never want to do when designing your roof is build one with a pitch lower than 3-12. This means that for every horizontal run of 12", you need at least 3" of rise. When you see this detail below, it is referring to the pitch of the roof. For the shed roof pictured above, the back has a 5-12 pitch. roof or a roof covered with a rubber membrane to prevent water penetration. 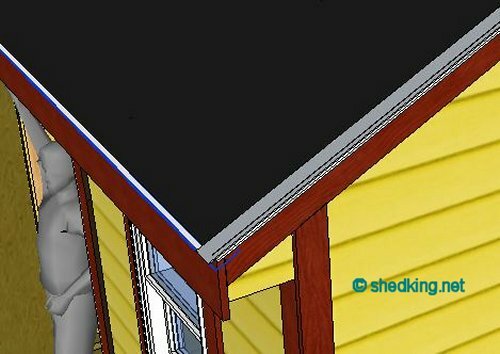 Turn in a set of building blueprints with a pitch less than 3-12, or build a shed style roof with a low pitch, and your building inspector will not pass the construction and provisions will have to be made to get the pitch up to acceptable standards if it is going to be shingled. Your shed may not be a livable space, but none the less, it is a structure in which you are going to invest a good sum of money on and you want it to last as long as possible without having to do any major repairs to. Adding drip edge and felt paper to your roof before putting down the shingles is definitely an option, but an option you should not ignore. If you don't invest the little bit of money it will take for these two items, you are asking for trouble down the road. Especially if you live in an area of the country where snow and ice are prevelant during the winter months. Freezing and thawing can wreck absolute havoc on a shed roof if it doesn't have felt paper and drip edge installed. The underlayment will mostly rot over a period of time and you will be looking at an expense of replacing or repairing your roof. Be wise and add felt paper and drip edge to your shed. along the bottom edges of your roof. Many local counties across the country now require the use of hurricane ties for roof framing on homes, and your shed is no different. If heavy winds can damage a roof by uplifting the trusses on a house, think what it can do to a shed! Hurricane ties are nailed on to the bottom of the rafter or truss, and to the top wall plates as shown in the picture above.